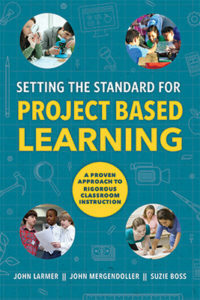 Project-Based Learning (PBL) is a major educational trend, as schools push to engage student and improve educational outcomes. While a lot can be said about the concept and place of PBL in contemporary schools, it is important to understand how to create, implement and assess it within the classroom. Setting the Standard for Project Based Learning: A Proven Approach to Rigorous Classroom Instruction (Larmer, Mergendoller & Boss, ASCD 2015) attempts to do just that, both from a leadership and practitioner’s level.